About 3 million people visit the Taj Mahal every year. This blog was viewed about 37,000 times in 2010. If it were the Taj Mahal, it would take about 5 days for that many people to see it. In 2010, there were 360 new posts, growing the total archive of this blog to 920 posts. There were 103 pictures uploaded, taking up a total of 24mb. That’s about 2 pictures per week. The busiest day of the year was May 7th with 691 views. The most popular post that day was Bye, Bye, Bob – Hello, Rebecca. The top referring sites in 2010 were en.wordpress.com, en.wikipedia.org, facebook.com, search.bt.com, and warelane.wordpress.com. Some visitors came searching, mostly for canvey beat, the canvey beat, terry smith armed robbery, canveybeat, and 1923turk. 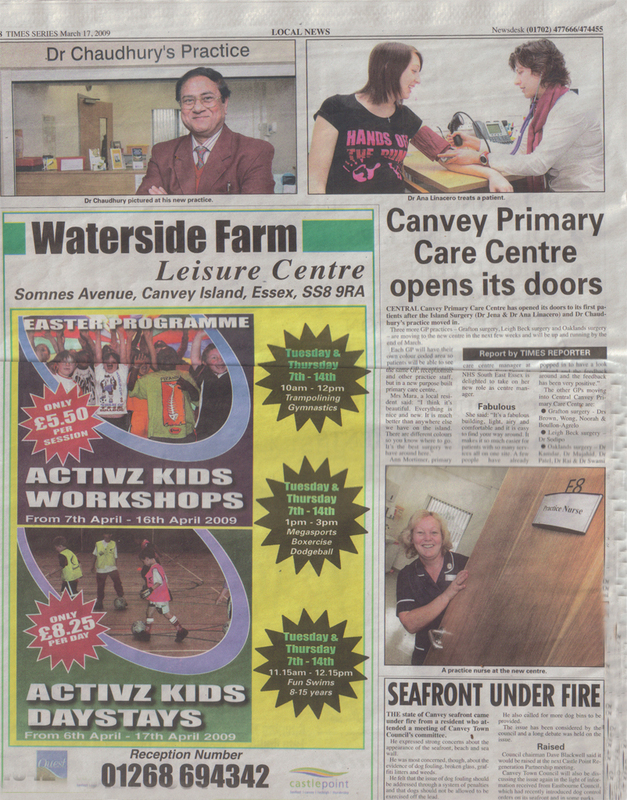 WORDPRESS has proved an excellent host; but the Canvey Beat has now outgrown its facilities. The Canvey Beat Blog is now hosted by BlogSpot at http://canveybeat.blogspot.com. VISITORS TO MY PERSONAL BLOG will have read of my intention to rein back on the amount of time I am currently devoting to the Canvey Beat. I had never intended to be tied-down to posting on a daily basis; but there were only three days in February; two in March; and just one, so far this month, when I have been able to take a whole day off. 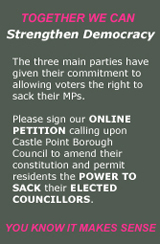 It has seemed that every time I had something planned: Spink would publish a misleading press release; the Echo would carry more Spink support; or the Canvey Island Independent Party would make another attempt to hoodwink residents. Lately those events have multiplied – and producing the Canvey Beat has become more like a full-time job. I will continue to monitor the local political situation on a daily basis until May 6th; but, after the election, I will be cutting the Canvey Beat’s publication back to just one day a week – setting a deadline, for myself, of midnight Friday for publishing on Saturday morning each week. In other words, the Canvey Beat is destined to become a week-end e-zine. If there are any ‘specials:’ I will Twitter them for the benefit of readers who have not subscribed to this blog’s RSS feed. The week-end format will no longer carry local interest articles from the national press (the time I spend selecting them each day does not warrant the number of readers they get). Instead, readers will see that this blog is now carrying the Independent’s political feed – along with the latest UK news from the Guardian and Telegraph – to replace Reuters (whom are apparently considering moving behind a pay-wall). SINCE WORDPRESS first introduced the facility, I have been providing the ability to ‘agree’ or ‘disagree’ with comments in the readers’ forum; but, during the past few weeks, it has become evident that Spink activists are devoting most of their time to inflating this blog’s ‘hits’ and modifying that opinion. I have therefore removed that facility – along with its sister means of being able to influence the type of posts – from this blog. AT THE REQUEST OF READERS, Canvey Island Independent Party borough councillor for the Winter Gardens ward, Neville Watson, has been blocked from commenting on all Canvey Beat posts. Oh dear blocking the person most people want to read strange but by what authority does Cynical Observer write this article? now we know he as rank don’t we, what a blunder this was your first big mistake, so who is this blogger Ted?. If you want to ban me so be it just Because you have someone that disagrees with you its called an opposition! that’s long been the problem you cannot handle an opposition. But if you want a blog that sits talking to one and other then carry on but one thing i know i feel my case here is won so i will say goodbye apart from all this i have enjoyed writing on here,its been both interesting but i guess you will have to deal with falling readership. His comment was reported as spam and removed – as will any further contribution, by him, to the readers’ forum.